Gopher Sport’s cooperative purchasing agreement with U.S. Communities for sports and fitness products can speed and simplify the acquisition process. Public sector agencies are often in the market for sports, fitness and physical education equipment and athletic supplies. Gopher Sport’s cooperative purchasing agreement with U.S. Communities for those products can speed and simplify the acquisition process. That was the message in a U.S. Communities on-demand video. Go here to view the video. Sherry Ramsey, procurement specialist for the Harford, Md., County Public Schools, outlined the features of the Gopher cooperative contract. The contract covers physical education equipment, athletic gear, sports equipment and related products and services. Taber Sawatzky, national sales manager at Gopher Sport, said his company, based in Owatonna Minn., offers over 7,000 products from 75 product categories, including 3,500 products that are unique to Gopher. The company commenced operations in 1947 and is celebrating its 70th anniversary. The firm processes 120,000 orders per year at the Owatonna facility, which includes customer service offices, product development operations and a fulfillment center. School districts and public agencies are among Gopher’s top customer categories. The photo to the left shows some of the firm’s product offerings. The barbells and other gear that the firm offers are made to Gopher’s product specifications, Sawatzky said. 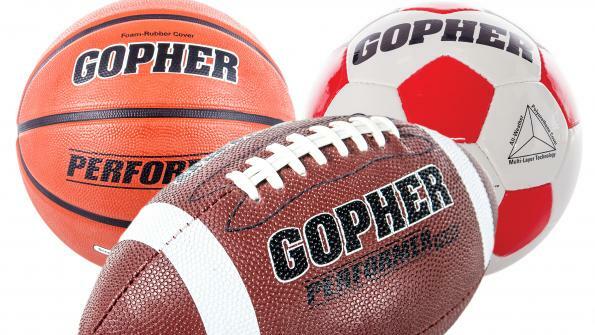 The firm offers Gopher brand products as well as major brands like Spalding and Wilson. The equipment is used in community education classes, in parks/recreation center programs, as well as in fitness clubs and school physical education classes. The firm offers an unconditional 100 percent satisfaction guarantee. “Our guarantee means that if you are not satisfied with any purchase for any reason at any time, we will replace the product, credit your account, or refund the purchase price,” Sawatzky said. David Kidd, a program manager for U.S. Communities for the southeast U.S. who is based in Florida, gave an overview of U.S. Communities during the video. Kidd explained that his company is overseen by an advisory board made up of public purchasing professionals. He noted that his firm’s advisory board members purchased over $160 million in goods and services through U.S. Communities’ cooperative contracts in 2015. The Harford school system is the lead public agency for the Athletic Supplies and P.E. Equipment contract, #16-SRD-010. It has a three-year initial term, through September 30, 2019 with options to renew for two additional two-year terms. The Harford district holds and manages the Gopher contract on a day-to-day basis.